A whole side of beef offers some many different cuts suitable for a wide range of different cooking methods, British and international recipes and seasonal treats. 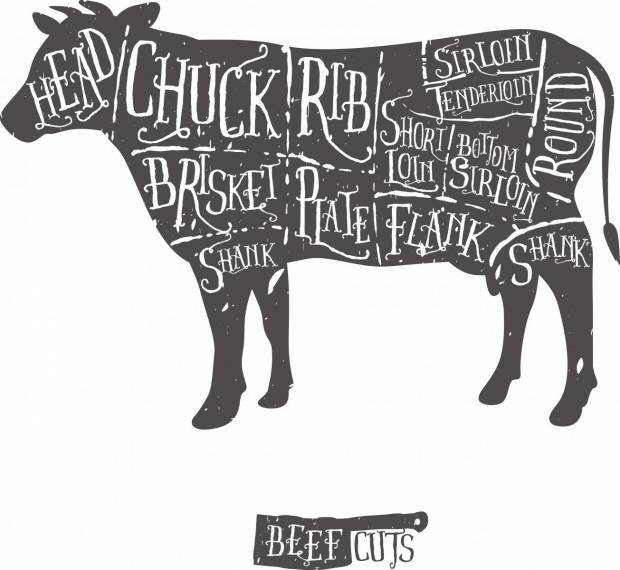 When choosing your beef from either your local butchers, or supermarket butchers, it is always worthwhile having a chat to them about the cut of beef most suitable for use in the recipe you are going to cook. Butchers are professionals, so don’t be frightened to ask your butcher cut a joint to your own individual requirements. They will be more than happy to advise on cuts and cooking. The tender cuts of meat, fillet and rib are most suited to frying, quick roasting or grilling, the less tender cuts e.g. neck and shin are most suited to slow cooking, braising and stewing. Fat – it is important to have a layer of fat or marbling (small white lines), as this gives the meat a much better flavour and offers increased tenderness. Chuck & blade - this cut is often sold as braising steak, a little tenderer than stewing steak, and can be ideally used in casseroles, stews and for braising. Blade steak is also sometimes known as “flatiron steak”. Fore Rib - sold ‘boned and rolled’, ‘French trimmed’ or ‘on the bone’, has good marbling throughout the flesh and has excellent fat cover on the outside making for a superb roast. This can also be cut into steak ‘Ribeye’s’, ideal for grilling, frying or barbecuing. Sirloin - this is typically sold boned and rolled. A prime cut, which is perfect for a classic Sunday roast. Sirloin steak is taken from the same area but is cut into steaks such as ‘T’-bone, Porterhouse and Entrecote. These are prime cuts, which are suitable for grilling, frying, stir-fries and barbecuing. Beef Fillet - also comes from this section. Probably the most prized cut of beef, the fillet is very tender and very lean, as a steak it is suitable for quick cooking under the grill or for frying. Larger pieces are used for dishes such as beef wellington. Other names for cuts of fillet include Filet Mignon, Tenderloin, Tournedos and Chateaubriand. Short Rib - a very dense and wholesome cut often used for mince. It is the equivalent of a spare rib and absolutely delicious served glazed. Rump - although this is a prime cut, it’s often cheaper than fillet or sirloin, because it’s not quite as tender. However many say that it has a far superior flavour than sirloin or fillet. Rump is suitable for quick cooking such as frying, stir-fry, grilling and barbecuing. Silverside & Topside - Silverside was traditionally salted and sold as a boiling joint for salt beef. This very lean piece of meat is now most often sold unsalted as a joint for roasting; regular basting is recommended during the cooking process. Topside is also a very lean joint and often has a layer of fat tied around it to help baste and keep it moist. This is also suitable for cutting into steaks to fry, grill or use in stir-fries. Oxtail – one of the most, flavoursome and inexpensive cuts of beef. Oxtail is most often sold cut into individual vertebra. Long and slow braising it will release their excellent rich flavour. Thick Flank - this joint is also known as ‘top rump’ good for slow roasting as a joint or braised in pieces. This can also be sold as stir fry strips or flash fry steak. Thin Flank - meat from this area is often known as ‘skirt’, ‘hanger steak’ (or ‘onglet’ in France). It has plenty of fat marbling making it moist and flavoursome. This cut is often used in Mexican recipes such as Fajitas. This cut is good for grilling, frying or barbecuing. Leg & Shin - Generally sold as stewing steak it is best suited for long, slow cooking to breakdown the high proportion of connective tissues and denser fibres, it also makes for thick sauces and gravy. Brisket - usually sold ‘boned and rolled’, and sometimes salted. This joint is suitable for slow cooking or pot roasting. Brisket is the cut traditionally used for making corned beef; it is also used for lean mince. Thick Rib - typically sold as braising steak. This cut is somewhat tenderer than stewing steak and is ideal for use in casseroles, stews and for braising. Clod - this is an economical cut that is a flavourful, but is a much less tender meat. Cut from the middle of the shoulder this is usually sold as stewing steak or used in burgers. This cut is suitable for slow cooking in stews. Neck - this cut is generally sold as stewing steak. Long and slow cooking will release a good flavour and produce a good tasty gravy or sauce.